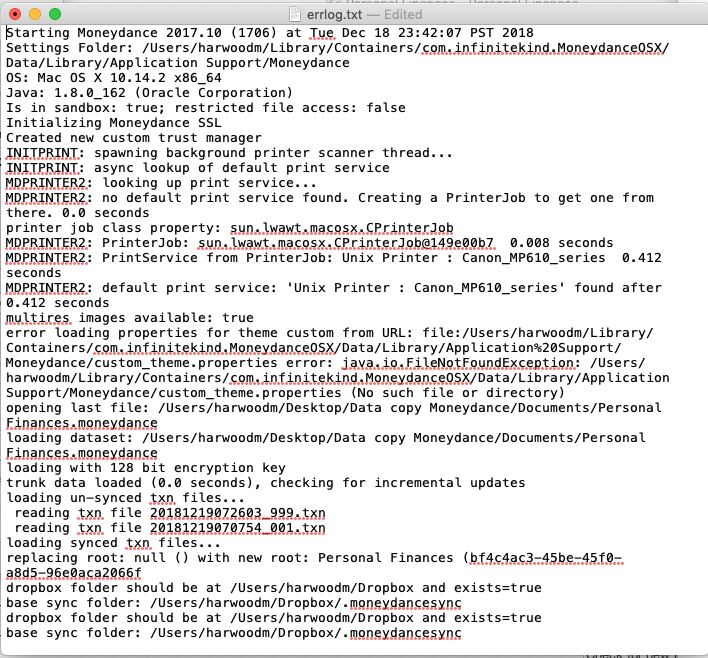 I have been using Moneydance successfully for several years on my iMac (now with OS 10.14.2), and syncing with my iPhone and iPad. I recently bought a MacBook Air 2017, with OS 10.13.6. I downloaded Moneydance to the MBAir, and saw the Welcome to Moneydance page. There was no request for my key. I went back to my iMac to find my data folder, which I did with some online help (right-click Moneydance title bar, click on Container). It contained the Personal Finances.moneydance file, which contained several megabytes of data. I then copied the folder and put it into Dropbox, in order to transfer it to my new computer. The Dropbox upload looks complete (green check by Data folder on both computers), but the Dropbox icons say that it's still uploading on the old computer and downloading on the new computer and will take several more hours. I decided that maybe the transfer would be faster through iCloud, so I went back to re-open Moneydance to access the data file on the old computer, and I got the Welcome page instead of the program, as if I had newly downloaded it. I don't know where my data files are. I looked at the Personal Finances.moneydance file in Dropbox on both computers, and it now contains only 16 bytes--it's just an alias. My data on my iPhone and iPad seem to be intact, and they still sync between each other. Where did my data go, and can I get it back onto Moneydance on my computers? Wow, Not sure where you data is. You have been doing a bunch of things without letting them complete etc. If you want to sync the Air with the iMac then you make one the primary (I assume the iMac) and the Air be a secondary. Turn on syncing on the iMac (use Dropbox folder method) and then on the Air open File->New from sync file. I think manually moving things to dropbox will remove them from your iMac. By moving your entire folder you also removed some of the preferences away from your iMac so it does not know about a default Moneydance data folder. or the ~/Library/Containers/com.infinitekind.MoneydanceOSX/Data/Documents or wherever the heck you took it from. Try to get the directory structure back the way it should be. Then go to the knowledge base directions on syncing and use that. Worst case find the file called "Personal Finances.moneydance" or what you called you account book. Find the file, not the alias on you iMac, in Dropbox or iCloud. Drag it to you Documents folder on the iMac and double click on that to open it. You may have to reset all your preferences but that should at least make your new Data file the one in your own Documents folder. Finally, and this is important, make sure you set up an automatic backup folder in preferences so you can get out of a similar SNAFU. The actual data folder wasn't moved. I I made a copy of the .com/infinitekind.MoneydanceOSX/Data folder, which is what I moved to Dropbox. The original folder is still where it is supposed to be, and it contains Documents/PersonalFinances.moneydance and also Library/ApplicationSupport/Moneydance. However none of these folders appear to have much of anything in them. The entire .com.infinitekind.MoneydanceOSX folder is only 106KB. I don't understand why moving a copy of the folder would cause a loss of data. I still don't know where my data went, I've tried searching the hard drive for anything related to Moneydance, but have come up empty. I found an error log in the folder, which I have attached, which appears related to the problem. That of course is wrong but somehow you have pointed MD at that copy. There is no reason that your data file should have suddenly become very small. I don't know what your normal data file size is. Try some of the recovery methods I outlined above. Move all your random copies of the data file on to removable media (i.e. flash drives) and remove from the system so you do not get confused as to which file is being opened. Note: The actual data file is a bundle (a directory that looks like a file) called "Personal Finances.moneydance" this is the default file name for your account book. Thank you for your help. I will follow your suggestions as soon as I can get back to my computer from a previously planned 3 week vacation. If, however, that doesn’t work, would it be possible to recover data by synching with my iPhone or iPad, which still have accounts listed and data intact up to 1 year ago? I just want to be sure the synnch goes in the right direction and that the iPhone doesn’t think that the empty data file on the computer is the up-to-date file to be copied The iPhone and computer don’t appear to be synched now, because I entered a test transaction in the iPhone, which didn’t show up on the computer. The iPhone and the iPad are synched to each other. Yes, you can recover by syncing another computer account as a secondary account. Then there is a python script that will change a secondary account to a primary. Then move the data file to the computer you want. CAREFULLY this time! I returned from vacation and suddenly realized that I use Carbonite Backup. I’ve never needed it and forgot that it is always running in the background. The Moneydance file was included in my backup, so I restored it and put it back where it belongs, then imported the latest archived Personal Finance data file into Moneydance on my iMac. Everything seems to be in order, except that it’s not set up to sync with my iPhone, iPad and MacBook Air. I don’t want to screw up again, so I’m asking for your advice. I want to import the current Personal Finance data to the new Moneydance program on the MacBook Air. I would like to be able to enter a transaction on any device and have it show up on all the others, and I also want to be able to generate reports on the iMac and MacBook Air. The iPhone and iPad still have all the files intact, because I haven’t added any permanent transactions during the period when the problem was occurring. They still are partially syncing to each other: a test transaction added or removed on the iPhone is reflected on the iPad, but not the other way around. I am going to assume that you will be using your iMac as your primary computer and your MacBook Air as your secondary computer. That on the iMac you can change the syncing method under FILE – SYNCING which verify that your data set is a primary data set, not a secondary data set. I this is correct proceed as follows otherwise post again. Ensure both computes are running 2017.10(1707) see under Moneydance menu - About Moneydance. If they are not make a FILE – EXPORT BACKUP on your primary computer and then update. On both your mobile devices use there setting menu to disconnect. Set primary computer “Sync Method” to “Don’t Sync” under FILE – SYNCING, then click OK.
On your primary computer use FILE – EXPORT BACKUP to save a backup in case something goes wrong. On your second computer click on HELP – SHOW DOCUMENT FOLDER to open a file explorer, close Moneydance and delete your data sets “yourdatasetname.moneydance”. Using your primary computer in the Dropbox folder delete the folder “.moneydancesync”. Watch the Dropbox icon and wait till it states “Up to Date”. This can talk some time. In your second computer check that in the Dropbox folder that the folder “.moneydancesync” has been automatically deleted. You need to give Dropbox a short time to complete this deletion. On your primary computer under FILE - SYNCING, set your “Encryption Passphrase”, set “Sync Method” to “Dropbox Folder”, click OK. Wait for Dropbox folder “.moneydancesync” and its contents to be created. Check the Dropbox icon states “Up to Date”. This can take some time. Wait until the same Dropbox folder appears on your second computer, again watch the Dropbox icon this time on your second computer and wait till it states “Up to Date”. On your second computer starting Moneydance should open it in the welcome window, click on “Create a new account set”. Select “Open Synced File” and use dropdown to select “Dropbox Folder” then click NEXT. After a short search delay, it should then list your un-synced data set name used on your primary computer. Highlight your data set name and click NEXT. Enter the encryption password, the “Encryption Passphrase” you set on your primary computer under FILE – SYNCING. Then click on FINISH. Wait for your data to be synced. You may find a lot of old, maybe closed accounts or other accounts you have removed from the side bar reappearing in the second computers side bar. Use the “+” sign at bottom of side bar then ADVANCED to tidy up the side bar. If in any step you don’t get things how I describe, detail what you are seeing, including screen shots. I proceeded through step 4. I then found that there was no ".moneydancesync" file in my Dropbox folder on the desktop or the laptop (step 5 & 6). So I proceeded to step 7, but found that when I did as instructed on the desktop to file=>sync=> Dropbox Folder, no new ".moneydancesync" folder appeared in Dropbox. I waited an hour, and tried again without success. So I decided to sync with Dropbox Connection instead, which worked. I opened the new Moneydance on the laptop and was able to sync it (steps 10-16). I was also able to sync the iPad and iPhone. So every thing is syncing with everything else. Thank you very much for your help. The present setup is fine, but I'm just curious to know why I can't sync using Dropbox Folder. Did you have the dropbox client install on the Mac, that is a prerequisite for Dropbox Folder. dwg is correct, if you are using Dropbox Folder the Dropbox client must be installed on all computers. With "Dropbox Connection" Moneydance uses the Dropbox API to talk to the Dropbox service directly. So, you don't need to have Dropbox client actually installed on your computer, but you do need to be online when Moneydance is running in order for changes to be synced. With "Drobox Folder" Moneydance will just read and write files to your Dropbox folder on your computer, which means that you need to have Dropbox client installed and running, but you don't need to be online in order for Moneydance to read and write the changes. Mobile device use Dropbox API but still sync with computers set to Dropbox Folder. I have the Dropbox application on both my desktop and laptop, with Dropbox folders on both computers and also on the iPhone and iPad that are all synced to each other. Interestingly, the .moneydancesync file appears in the Dropbox folders on the iPhone and iPad and also on the Dropbox website, but not in the Dropbox folders on the desktop or laptop. Strange, is Dropbox client installed on the same drive as Moneydance that is the C drive? Tested both Dropbox Folder and Dropbox Connection and both install the ".moneydancesync" folder in Dropbox client on my windows C drive. Have you more than one Dropbox account? Dropbox and Moneydanceare are both installed on the hard drive each of my Mac computers. There are no other drives that I’m aware of. I have only one Dropbox account. My desktop computer is running OS 10.14.2 (Mojave), and has been upgraded through several versions since purchased in 2012. The newly purchased MacBook Air is a 2017 model and is running OS 10.13.6 (High Sierra), which came with it. I wonder if the slight difference in operating systems is causing the difficulty, although there has been no problem syncing the Dropbox folders between computers, and no problem syncing Moneydance using Dropbox Connection. It is a Mac so there is no C drive. 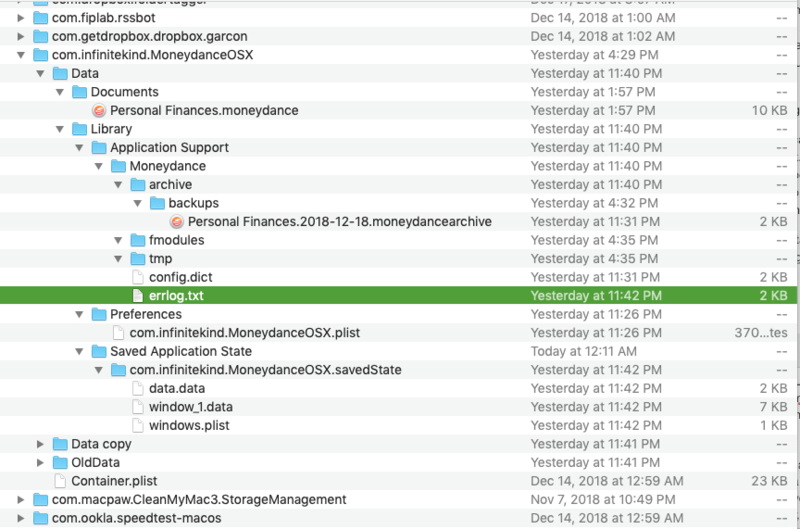 Files such as the .moneydancesync folder will not show up in the finder due to the initial . which makes them a hidden folder. You can check to see if it exists by opening a Finder window, typing CMD-Shift-G and then pasting ~/Dropbox/.moneydancesync/ into the box that opens up. If that will open a window then the folder exists and you can delete all the files inside it instead of the folder itself for step 5, that will do the same thing to reset the sync. Thanks for the insight into Mac. Yes, that worked. All devices now synced using Dropbox Folder. Thanks for your help derekent23, sth and dwg. Glad that all got resolved! Thanks for the feedback. Glad you are back on track. System closed this discussion on 22 Apr, 2019 09:00 AM.